Managing your accounts can be a very hectic task. To keep track of invoices and transaction along with handling your accounts, RepairDesk brings to you a very useful integration. 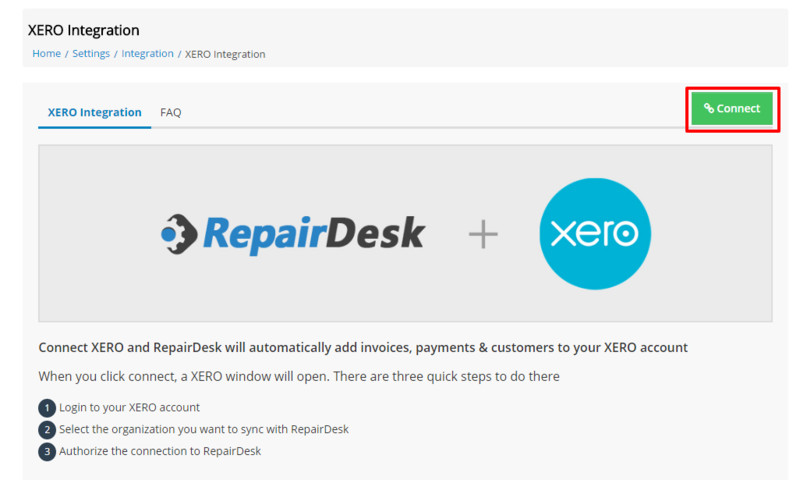 With RepairDesk's Xero Integration those customers who are using Xero for their accounting needs can easily link their inventory and invoices with Xero, allowing business owners and accounts to stay connected with their data on the go! 1. 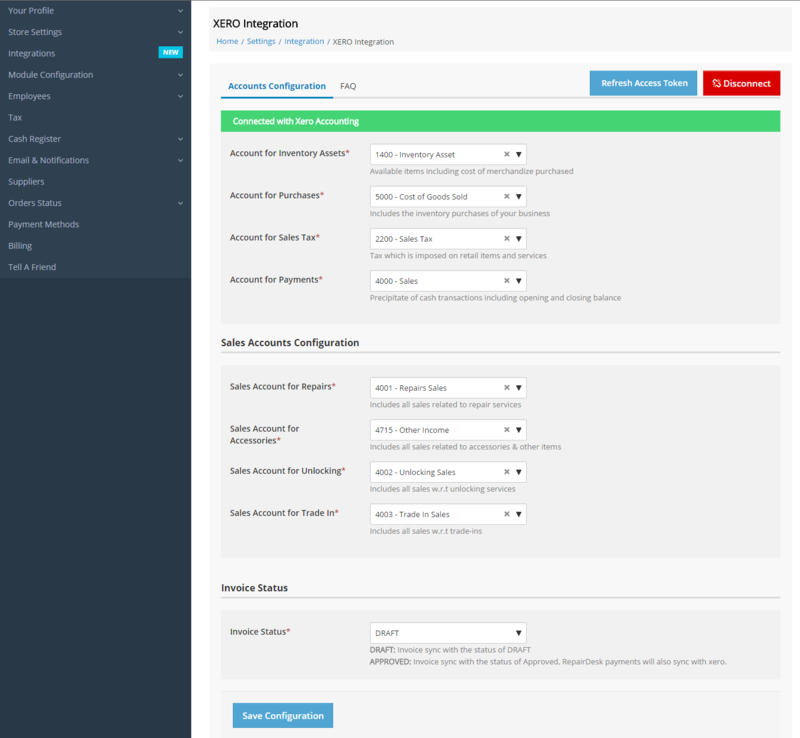 Go to Settings >> Integrations >> Xero and press the Click Here button. 2. Click on Connect button. 3. 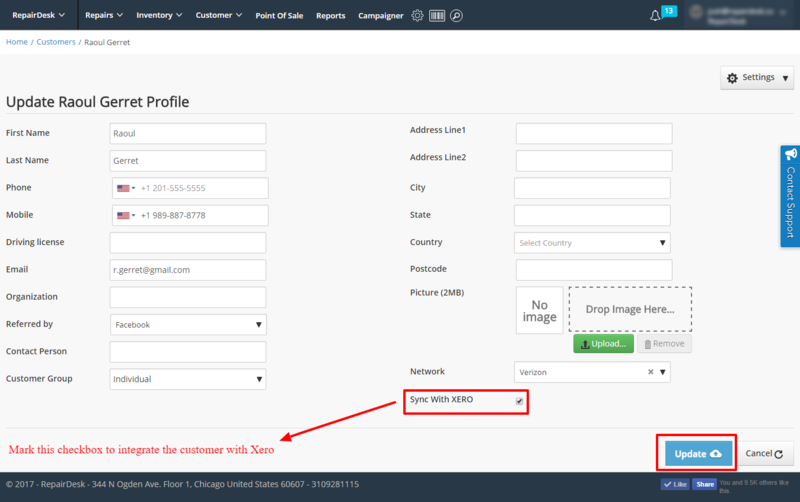 This will take you to Xero login page. Enter your login credentials for your account or sign up for an account on Xero if you don't have one. 4. Select your organization from the drop down menu and click on Allow Access. 5. After selecting company and clicking on Allow Access, you will be redirected to Xero Accounting setup page in RepairDesk. Select accounts from drop down menus to configure accounts in Xero with RepairDesk. Note: Please refer to your accounting department's designated accounts. If you cannot find individual sales accounts for repairs, accessories, unlocking or trade in, please create them in Xero. 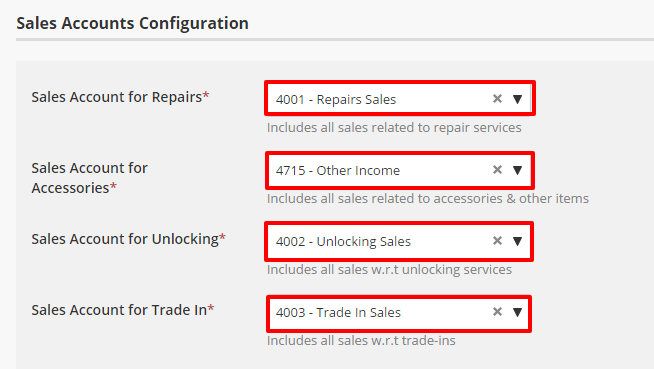 If want to use a single sales account for repairs, accessories, unlocking and trade in, select account '4000 - Sales' for all of these. You can set Invoice Status as either Draft or Approved. If you have set invoice status as Draft then an invoice created in RepairDesk will go to Xero but you would have to approve it later. Only after approval related accounts will be updated. If Invoice Status is set as Approved, invoices will directly sync with Xero and relevant accounts will be updated without the need to review them. Once all accounts are set, click on Save Configuration button to save changes. Q. How many requests can Xero process at a time? A. Xero can process 60 requests per minute, be it either customer, inventory or invoice request. So if you are syncing a large amount of inventory, customers or invoices, Xero will take time to sync them. For more information, please refer to this article by Xero. Q. How to sync individual RepairDesk Customers with Xero? 2. Open an existing customer and edit it. 3. Click on Sync with XERO and hit Update. 4. You can also do this while adding a new customer. 5. 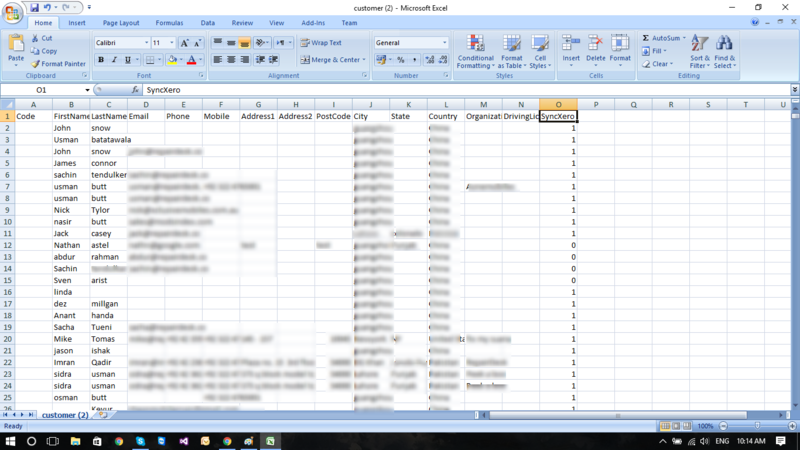 To integrate multiple customers with Xero at once, first export the Customer CSV file. Then under the column for Xero in the customer CSV file change the value to 1 for those customers whom you wish to integrate with Xero. 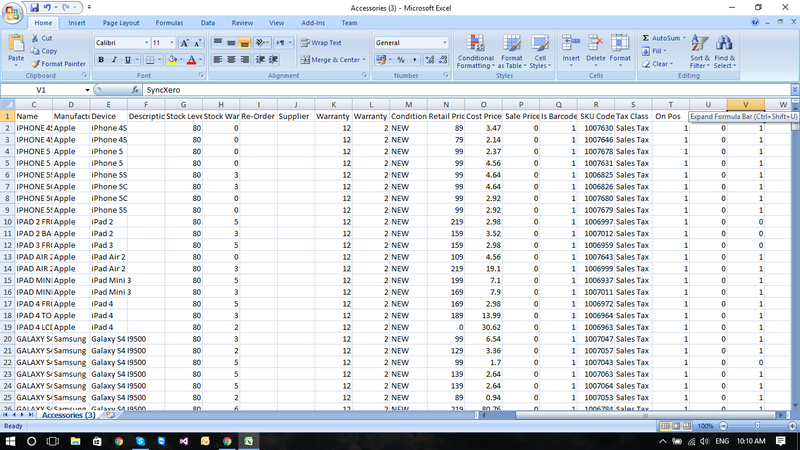 Finally, import the customer CSV file. Q. How to export individual inventory items in RepairDesk to Xero? 1. Go to Inventory >> Manage Inventory >> Mobile, Accessories & Parts. 2. Open an item from the Inventory list. 3. Click on Sync with Xero checkbox and click on Save Item button. 4. Select an item category such as Accessories/ Parts. 5. You can also do this while adding a new item. 6. To integrate multiple items with Xero at once, first export the Accessories CSV file. Then under the column for Xero in the Accessories CSV file change the value to 1 for those items whom you wish to integrate with Xero. Finally, import the Accessories CSV file. Q. Is overall discount carried to Xero? A. No. Overall discount is not carried to Xero. However, line item discount is carried. Q. Can I edit an invoice in Xero? A. You can edit an invoice in Xero until there is some due amount. Otherwise, it is not editable. Q. I've created an invoice on RepairDesk but it hasn't appeared on Xero? A. Invoices will be update on Xero after an average time of 2 to 3 minutes. Each invoice will not be updated at once. Rather invoices accumulated will be updated together within the average time. Q. Item is not appearing on Xero. Why? A. Item synced with Xero shall appear there. Otherwise it wont. Please make sure that the item is properly synced with Xero, Also make sure that against inventory asset account in configuration you have selected 1400 - Inventory Asset account. Q. How can I integrate multiple items with Xero simultaneously via CSV file? 2. Download the CSV file by clicking on the Import Inventory Button and select Export Inventory. 3. Open the file and under the column SyncXero mark the items you want to integrate with Xero by entering 1 in the cells. 4. Once you are done, upload the file by clicking on the Import Inventory button and selecting the Import option. Q. How can I integrate multiple customers with Xero simultaneously via CSV file? 1. Go to Customer >> Manage Customer. 2. Download the CSV file by clicking on the Import Customer Button and select Export Customers. 3. Open the file and under the column SyncXero mark the customers whom you want to integrate with Xero by entering 1 in the cells. 4. Once you are done, upload the file by clicking on the Import Customers button and selecting the Import option. Q. There is a discrepancy between inventory in Xero and RepairDesk then how can I fix it? A. If Inventory quantity in Xero and RepairDesk is less than one (i.e. zero), then no invoice would be generated in Xero. To create invoice in Xero, it is necessary that inventory quantity for an item should be same in Xero and RepairDesk. If inventory quantity is unequal then user should create a Purchase Order (PO) in RepairDesk and in Xero. Once these PO are received, then inventory quantity would become equal in both Xero and RepairDesk. Q. How can I know which invoices have been synced or not with Xero? A. Once Xero has been integrated with RepairDesk, you will see a column in Manage Invoice section that will inform you which invoices are synced and which have not been synced yet. Pending - Invoice has neither synced, nor is in Queue. It can be due to many factors such as failed syncing. Failed - Invoice failed syncing. In case of Failed syncing you can check API reponse, click action button and click on Xero API response. 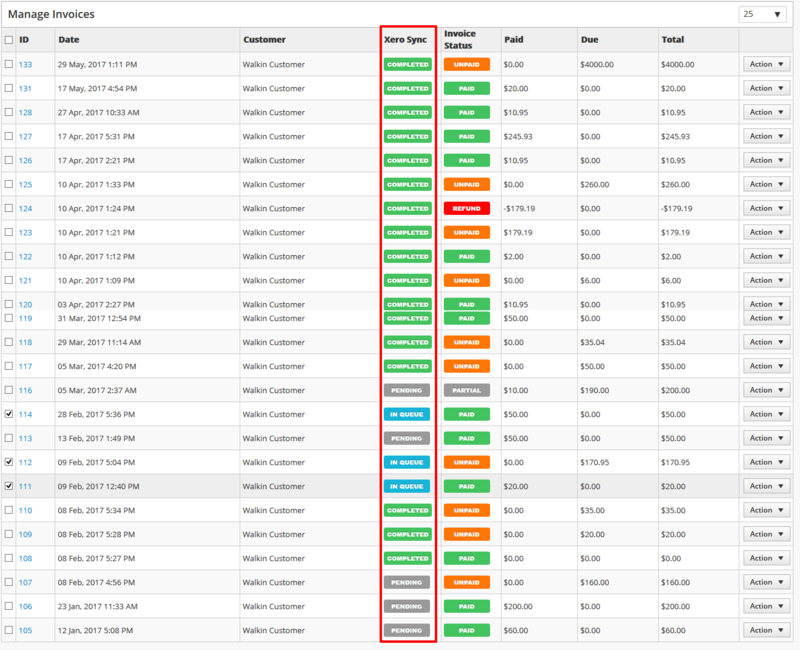 If you wish to see only those invoices with a particular syncing status (i.e. pending), click on the Search Filter on Manage Invoices. From XERO STATUS search filter drop-down, select the required syncing status and click on Search to display results. Q. How can I sync an individual invoice with Xero? A. On Manage Invoice section, click on Action against an invoice and select Sync with Xero from the menu (see attached screenshot). Q. How can I sync multiple invoice? A. To sync multiple invoice, select the invoices which you want to sync, click on Action button and click on Sync with Xero. All selected invoices will be synced with Xero (see attached screenshot).